At the League of Education Voters (LEV), we recognize all of the hard work that you do toward improving public education across Washington state. We are pleased to announce our Activist of the Month for August: Vanessa Hernandez. The Every Student Counts Alliance (ESCA) is a new collaboration between organizations and individuals in Spokane working to end the overuse of suspension and expulsion in Spokane Public Schools and to eliminate disparities in rates of suspension and expulsion of students of color and students with disabilities. 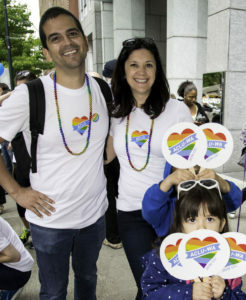 LEV is part of the Alliance, along with the American Civil Liberties Union of Washington and its Youth Policy Director, Vanessa Torres Hernandez. One of the primary goals of the Alliance is to promote positive and restorative school cultures, where teachers and students feel equally supported, individual needs are met and voices are heard. This ensures that students remain in school on a path toward academic and life success. Vanessa comes to this work both as a legal advocate and as a former teacher. A native of Guam, Vanessa grew up in a family devoted to public service. During college, she taught in after-school and summer school programs throughout the country and also volunteered in public schools. After receiving her M.Ed. in Teaching and Curriculum from Harvard University, Vanessa began a teaching career at Roxbury Preparatory Charter School in Boston, a charter school serving low-income students of color. She was moved by how the students who faced steep academic and socioeconomic challenges excelled in a school focused on student and teacher support and achievement. Taking the experiences, lessons, and memories from teaching in Boston, she transitioned into teaching 7th graders in Washington state. Her class focused on empowering students with knowledge, developing their skills to understanding bias, evaluate information and advocate for what they believe is right. Vanessa then transitioned to the University of Washington School of Law, where she participated in a public service law program. Vanessa first worked with the ACLU as an attorney with a project focused on criminal justice reform and the challenges facing people returning from prisons and jails. After a short time working with ACLU, she realized that she loved how they employed a long-term view and relentless push for justice, similar to her work ethic and mindset. This year, she will celebrate her five-year anniversary with the organization. Vanessa started in the litigation department and moved in October 2015 to the position of Youth Policy Director, where she continues her passion for helping others and using the power of the law to contribute to social movements. Promoting student success was an important concern this past legislative session, and it led to passage of the Opportunity Gap Bill (HB 1541). Vanessa says it is a great first step in the right direction, in terms of recognizing that a student’s behavior should not affect the education he or she receives. But she adds that there is a lot more progress to be made.